It’s cold out. We had 4″ of snow last night and whilst it’s all very pretty, it’s really cold. At times like this it’s nice to remember that it will warm up again and I’ll be out in the garden, so for breakfast I had homemade raspberry jam, made from the raspberries from the garden. It’s good. Jam is remarkably straightforward to make. You don’t have to be a great cook. For this jam I just used equal weights of raspberries and jam sugar. I sometimes add a little lemon or lime zest if I’m feeling fancy, but it’s not necessary. Although it is easy, making raspberry jam is time consuming. You need to put the raspberries in the pan the night before and pour the sugar over them. The weight of the sugar squishes the raspberries and releases juice, into which the sugar dissolves. By morning all the sugar should be red, give it a stir and it will be a gloopy, syrupy liquid with raspberry lumps. You don’t have to do this, but I find it makes a more integrated jam. I use old jam and marmalade jars, which have been cleaned and stored, but I put them on the super hot wash in the dishwasher to sterilise them as I’m making the jam. The trick is to get the jam mixture to the right temperature. You can use a cold plate to see if a drop sets, testing by pushing your finger through the cooled blob, if it wrinkles it will set, but the much more reliable way is to use a jam thermometer, or candy thermometer as it’s sometimes called. They are cheap, but if you don’t have one, odds are you’ll know someone who has and you can borrow it. It’s not like they get used every day. You need to get the temperature to 220F or 105C. Whilst the jam is cooking up to this temperature, weird grim bubbly scum comes to the top. It’s edible, but I don’t like it so I scoop it off with a ladle into a bowl and throw it out when it’s cool. It sets to a bright pink foam, I guess you could pour it into shrimp moulds and make foam shrimps. It also gives you a good clue as to how well you’ve washed your fruit as any bits of leaf or heaven-forfend, insect, will rise up in this goo. 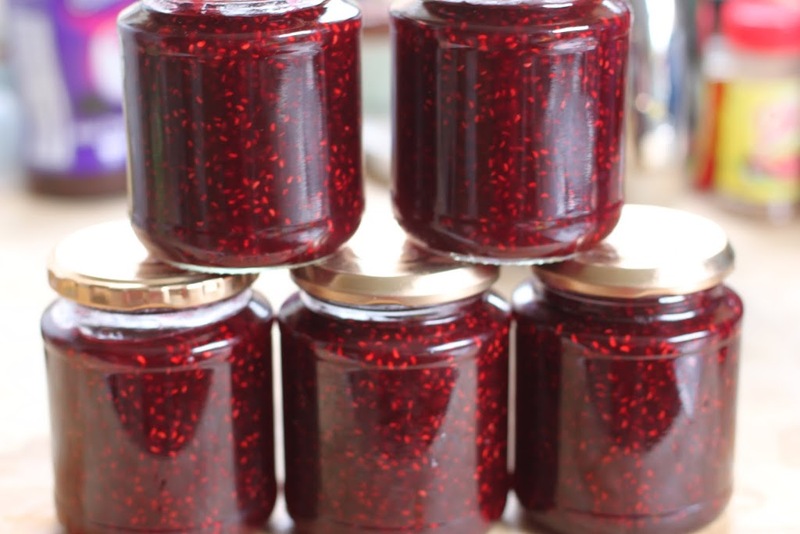 When your jam has reached the right temperature you need to put it in jars whilst still hot. You could pour it in, but it’s very dangerous. The jam will burn you and stick to you, so you don’t want to run any risk of spilling it. I use a ladle to transfer it into the jars. I like the ones that have the little ‘pop’ button on the top, this will still be sticking up when you put the lid on – using a dry tea towel in each hand as the jars will be very hot. As the jars cool down, the button will pop back down, reassuring you that no air will get in, as a vacuum seal has been formed. Leave the jars on the side overnight as they will take a while to cool down fully. If any lids don’t pop down then you’ll need to keep those jars in the fridge and eat them first.